"Further" is the name I gave to the unamed Windrider Rave Hydrofoil before I left, as I didn't want to sail a boat without a name. The passage I made in 1999 became the most publicized trip I've made. At the time, I didn't think much about it. It was just a trip I made, like so many others, a favor for some new friends, a good adventure, and a great time. But I just did it, and went on about my business. 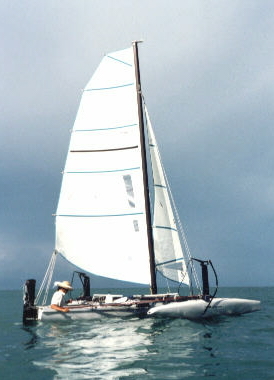 Later, it seems I had made somewhat of a stir in the hydrofoil and sailing community, having incidentally and unintentionally achieved an undocumented world's record passage for the class of boat. So it goes. I would never have noticed if one of the owner's groups hadn't brought it to my attention. To respond to the interest, I have tried to document and describe this trip in more detail. I transcribed the entire Captain's Log as a narrative, with a introduction providing background and trying to answer questions raised by readers of the original Log 9-99 and the Captain's Log itself. In truth, though it includes the positions and observations of a traditional Captain's Log, it is more the experience of the passage, from my journals, which serve as my logbooks as well. and of the Quintana Roo coast from the NE tip of Yucatan south to San Pedro, Belize and Chetumal, Mexico. Finally, I have included specification diagrams of the Windrider Rave Hydrofoil itself. The following is the short piece that appeared on my NEWS page in the fall of 1999, soon after I got back. Its been great, in many ways, though its really been a grueling, hard trip. Still, its just the type of thing that I like to do. I like the times that test you. Its not really fun, its intense. I like the life that brings out the steel in you, the fire, the sheer ability and strength of will that it takes. I seek the energy, images, and emotions in the experiences encountered on a journey like this, to feed the music; the passion and fury of a storm at sea, the gentle deep beauty of a sunset, and the nights full of stars, "when I walk the lonely beaches, and stare far out to sea..."
So I had it to do and I got it done, walked the road less travelled, in fact, the road untravelled would be more like it. You have time to think, out there, and time to not think. And you ponder the truths that make themselves obvious. You can sail a track across the sea, but you leave no mark, instead, the sea leaves its mark upon you. Though I have "boldly done", I was actually following in the footsteps of the ancient Mayan canoes. Funny world, sure enough. Of course, I took the dulcimer. It just barely fit, and it was a hard journey for my old companero. It was underwater several times and soaked a few more, not to mention the snake...(you can e-mail me if you'd like to hear the whole story). I played for everyone, the Bardic Way. 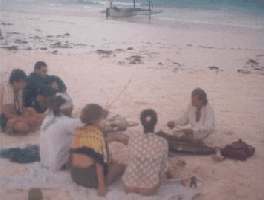 I played on the beach and on the street, in shops and restaurants, on the dock and out on their boats for the other cruisers, for Mexican fisherman in isolated camps, for tourists and travelers. In the end, I feel sure I can shift my winter season from Florida to Quintana Roo, without a doubt. The only problem with the trip was having months taken up in delays for repairs, in finding a place to store the boat once I got to Belize (I ended up having to backtrack into Mexico to find a place), and from the deteriorating weather as the delays used up the last of Spring's good weather and pushed me right into a bad summer storm season. I never had time to enjoy the trip, really, exploring or diving. I had to keep pushing just to get the job done. I watched the summer festival season slip away, till I ended up cancelling the first festival I had planned for the summer, and decided not to book anymore. I missed going to Alaska this year, and I miss that most of all. But at least it was due to circumstances beyond my control, though that still doesn't stop me from being dissappointed. As well, all my other plans have been on hold alot longer than I bargained on, so now I have to get into high gear here on the web, and in getting the digital recording equipment together.